We're going to go on now and look at a few unusual problems, the kind that aren't straightforward. Do a derivative, take an integral problems. But ones where you have to step back and think about theory to figure out what's going on. Now, I have a lot of these built into the course, a lot of which are contained in the episodes called AP tricks. AP tricks 2, 3, 4, etcetera. They are not really tricks, they are not gimmicks. They really do mean something. But you need to be prepared for them, because they are not the type of problem that you likely did a ton of when you're learning the Calculus. Typically, in a typical course, you don't actually do these until the last stages review for the AP test. Here is one right here. This problem doesn't have a ton of theory on it, but it's from earlier in the year. And if you are now looking at this course in April or March, you might have forgotten some of these stuff. On this problem, I've got a graph and I'm going to ask you to find a whole bunch of different limits and the derivative value and another limit. Let's see what happens. Now, this one is the limit of the function. The function's graphed. This kind of problem you aren't given a formula for the function, you're just given what it looks like on the graph. Supposed to find the limit as x is getting closer and closer to -1. That other minus means that you're coming in from the side where the numbers are smaller, coming in from the left side. So as I do that, coming in to -1 from there, you get to that open circle. Now you can't actually take this function, put -1 into it, and get that for the result. You won't get 4 for the result. But limits allow you to get infinitely close to something that the formula can't do. So, the limit coming in from the left side really is 4. But coming in from the right hand side, coming in towards -1 from the positive side, from the right hand side, it's getting lower and lower. In that case, the result is +1. Well, you have two different results depending on which side you come in from. This is a non-continuous function. Later episodes do a lot about continuity and a problem that's even more involved than this. You'll want to check that one out later or maybe if you are feeling confident about this, go and find it now and then come back later. Well, here's another thing though. If you're supposed to find the limit approaching -1, and there is no little + or - given there, it's not a one sided limit like this. It's a regular two sided limit. If you come in from this side, you get 4. If you come in from this side you get 1. Which one's right? They are both righ, but they can't be both right at the same time. So you have to say the 2 side of the limit does not exist at that spot. It doesn't exist, it's impossible. While we're on that point, I'm going to add one more thing that I didn't write down here. What if you were actually to take the function and put -1 into it? Which answer would you get? It's that one. The one that's a solid dot. So the functions actually defined -1, and the result of it is 1. Derivative at 2. Let's find 2. Here's 2, right above there. So the derivative of that looks like it's about 2.5. No, it isn't. That's the function value that's about 2.5. 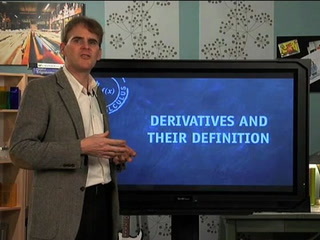 What does a derivative mean? We've probably said this everyday since the beginning of the second quarter. Derivatives are slope. Even though I don't know what the function is, I can actually find the slope at that spot. That looks like a straight line so, hey, rise over run, your old friend. So this location right here is at (3,3). This location is at (-1,1). And well, the point that we want, the point where we want this slope is straight between there and there. So the slope is the same all the way along that straight line. You find the slope between the endpoints, it's going to be the slope of that spot. Let's work it out. It'll just take a second. So, the slope is your old friend, rise over run. When I do slopes, I like to do a little trick that maybe you think I'm too old for this. This is Algebra 1, let's still do it anyhow. It's easier to get something flip flop, even though you've been doing this for years now. The trick I like to use is I take one of the points and put it in at a time. Notice I got a line there, minus minus. When y is 3, put that on the top, the x that goes with that in the ordered pair has to be right below it. When y is 1, the x that goes with that one in the ordered pair is -1. 3-1 is 2. 3-(-1) is 4 and 2/4 simplifies to 1/2. There we go. That is the value of the derivative at 2. The limit as x approaches 3 from both sides. As you approach 3 from this side, you get 3. As you approach 3 from this side, you get 3, so the limit exists. You can do limits for places that just work in the function. You see enough like the spot right here, as you approach 2 from the left or right side, you get an actual function value of about 2.5. So the limit is 2.5. You just don't normally bother doing limits, unless it's in an impossible spot like that. That's easy enough. Here is something that you might have forgotten. In order to do a derivative, it has to be continuous in what you call differentiable. To be differentiable, the slope coming in to both sides of the spot has to be the same. I'll give you one where it works. The limit right here, the slope actually works because as you're coming in towards that spot, the slope is 1/2. As you're coming from the right hand side, the slope is still 1/2. You get the same slope coming in either way. So the derivative exists there. But on this side, when you're coming to 3, if you're coming from this side, the slope approaching 3 is 1/2 and the slope approaching from this side looks like maybe -1. Different slopes immediately on either side of that sharp point. That means that it doesn't exist, you can't do the derivative at that spot. Derivative does not exist. You tend to see those of course in absolute value graphs. You can't do the derivative of an absolute value graph at the point where it turns around. The next problem we are going to do in the mixed bag of problems that make the latter half of this episode, is linear approximations. Now, you may have done Newton's method in your Calculus course. You might have done it. 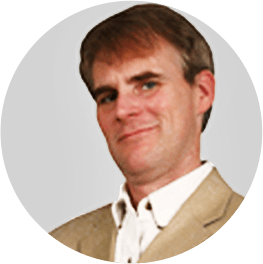 Newton's method is one for finding approximations of zeros by using local linear approximations for the curves. I teach it in my AP Calculus class, but you might not have seen it. If you haven't, don't worry. They don't have Newton's method in the AP test. They don't have it on there and it won't be included in this Brightstorm course. You're not going to need it. It's rarely used these days, it's taught mostly for theory. Because what it does can be done much more quickly and accurately with a graph and calculator. However, you might have something much simpler again like this where, you know something is differentiable. And you're given some data about the function without actually being given the function. And you're going to have to produce an estimate for what g(2.9) is, by assuming that the line is close to the real thing. So let me show you what this looks like. Make a little bit of a graph. You don't really need the graph to do the problem but it is essential for understanding what's happening. We know that this goes through (3,17), it's a given point down the curve. I have no idea what the curve is shaped like, and we never will because we are not given the function. But we do know a couple of things about it. We know that the slope right at 3 is -5. So when it passes through there, it should be going downwards pretty steeply, kind of like this. But after that happens, who knows? Maybe it goes up for a little way and then over like that. I know I had that overlap a little bit so it's technically not a function, but ignore that for now. I just need some clear space to show you what we are going to be doing. So, let's say that 2.9 is here. This is the actual 2.9, f(2.9). It's the real thing, which we'll never have because we don't know the function. We are going to do the linear approximation. If you start with this spot and draw a line, you'd have a tangent line to the curve and that tangent line would have a slope of -5. Fix that line a little bit right here. There is your tangent line. We are going to find this location right here, which is going to have an x co-ordinate of 2.9. And the y coordinate is going to be obtained by using this slope of a straight line. Rise over run, your old friend from Algebra 1. Let's fill it in. Slope equals rise over run. Fill in the numbers. You're saying, I don't know the slope. Yes you do. Derivative gives you the slope. The slope at that spot is -5. Fill it in. The rise going from here to here, the rise is unknown. We've got to work that out. But we can find the run with the given information. Rise is unknown. For the run we're going from a location of 3 to an x location of 2.9. So that's a run of -0.1. Fill that in. Now I can find out the rise just by multiplying both sides by -0.1 and that tells me that the rise on this is going to be +0.5. So it goes up 0.5. When x is 3 this is 17, when x is 2.9, the linear approximation is 0.5 higher or 17.5. So I can write this, I can write down that g(2.9) is approximately 17.5. Know what they said about the backwards poet? They said they wrote inverse. Seriously, inverses. The problems you see like this, they are not going to tell you that it's inverse. They're just going to give you an important clue, that you're dealing with an inverse. This is the clue. It says that g(f(x)) equals x. In other words, if you take x and put it into the f formula, you get a result. Then if you take that result, and put it in the g formula, you get your original number back. So the functions undo each other. This first part is easy once you realize that you're dealing with an inverse. If you put 7 into the g formula, you get 9. The f formula is an inverse. So that means that if you put 9 into the f formula, you get 7. No work needed. There we go, first answer. Second answer, it's a little bit tougher. We're supposed to find f'(9). Now, this particular formula is one that can be derived and I'd love to do it for you. But, A, we don't have the time and B, you don't have the time because if you see this on the AP test, sorry. You don't have the time to work out the derivation. I'd really recommend that you just memorize this thing. What it says is that, if you want to find the derivative of a function at a particular location, you can put the particular location into the original function, and put that result into the derivative formula of its inverse. Do 1 over that, and you've got the result. So let's do this. It really helps to be systematic on these because it's really easy to get turned around. But if you're systematic and replace replace your numbers one at a time, it's really not bad at all. So we specifically want f'(9). To do that we are going to have to get g'(f(9)). Notice that I took the x and I put it all the way deep inside there. This one takes a couple of steps. See what I mean about being systematic. Now f(9), I do know that. It's 7, I just found out that it's 7. So that means that I can replace g'(f'(9)) with g'(7). F(9) is 7. We're almost done. g'(7), that's 11. There you have it. Upcoming episodes are going to include both basic operations and more of these unusual problems. More of the strange problems that you're very likely to see on the test. Beware though, the whole test isn't all weird tricky problems. There are straightforward problems, particularly in the multiple choice section. Don't panic and think that everything is going to be this unusual problems that you haven't done many of yet. Well, before we go, by the time you're done with this course you're going to realize, I just love really lame jokes, truly lame jokes. So, I'll give you one more. You know what they said about the chicken that was running across the road? Oh, it's like poultry in motion.